Salmon lasagna, lentil salad, organic spinach and more…what French kindergarden kids are eating this week in Paris! This week, we’re in Paris (well, virtually anyway), in the 17th arrondissement (Place de la Concorde!). School lunches are organized by neighborhood (arrondissement) in Paris, with all of the kids in a neighborhood eating the same menu (usually prepared in large ‘central kitchens’ before being shipped out to individual schools, although some schools still have cooks on the premises). As usual, the schools post the menu online for eager parents to check out what their progeny will be eating. 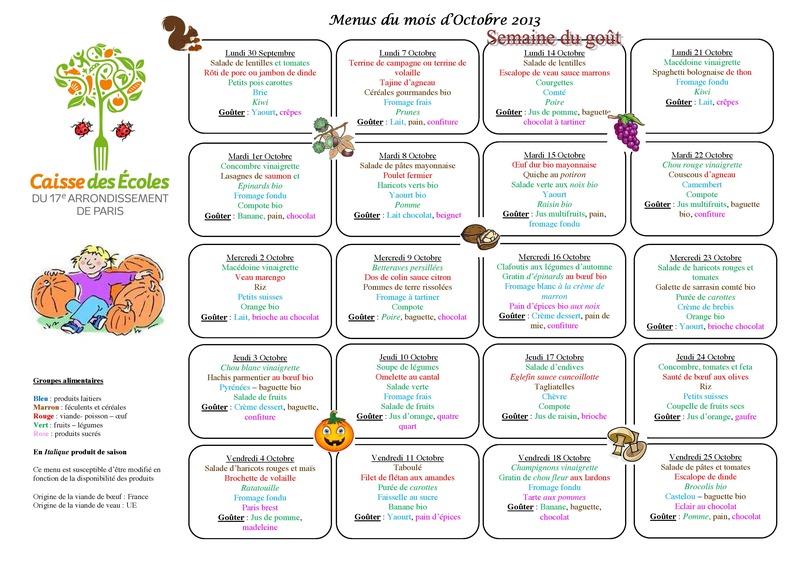 This menu is for the children in kindergarten (maternelle), from 3 to 5 years olds. Check out the menu for the rest of the month. Impressive! This week we’re in Saint-Julien-de-Genevois (population 5000), a small town in the Alps in south-eastern France, right on the border with Switzerland (in fact, it’s a suburb of Geneva–many French people choose to live here but commute into town every day). The Town Hall has a ‘Menus Committee’, where parents and elected representatives approve the menus every month. Colorful menus (like this one) are sent home, posted on school doors, and available online, so everyone knows what the children are eating. And it sounds pretty good (see that dessert? It’s on this weeks’ menu!). Cheese/Dairy:Reblochon de Savoie A traditional unpasteurized cheese from the Alps: richm creamy yellow, nutty-tasting, and a little stinky! Dessert: Liégeois au chocolat The treat of the week! 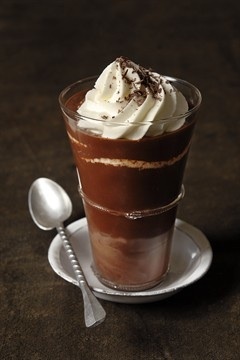 A rich chocolate ice cream topped with whipped cream, served in a tall glass. Say no more. Like many small towns and villages, Saint-Julien has decided to outsource its meals to a private company, which makes them locally. It’s a more cost-effective approach–particularly because health and hygiene regulations are so strict, making it prohibitively expensive for many small towns to upgrade kitchens, train staff, and follow the complicated healthy regulations (for example, every meal is sampled, and the samples are stored frozen for several weeks in case of any food poisoning). The issue of whether or not to keep the meals ‘in-house’ has caused much controversy in France in recent years, with no end in sight. I’ll be blogging next month about the pros and cons of ‘do-it-yourself’ versus ‘bring in the food company’ — a choice many schools in other countries are facing. ps The grated carrot salad is on my blog, here. What's for school lunch in France's poorest town this week? Sautéed veal and celery salad, roast pork and cauliflower-curry casserole…and more! 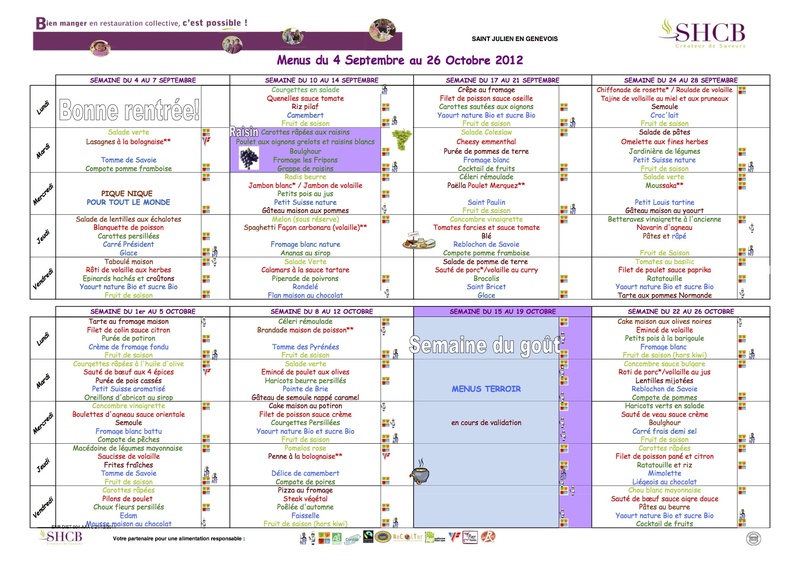 I blogged last year about menus in France’s poorest town: Denain. It’s a small town (population: 20,000) in northern France. It used to be one of the country’s wealthiest industrial cities (and was known as the ‘city of a thousand chimneys’). Denindustrialization, the decline of France’s domestic textile industry, and the closing of the town’s last steel mill in the 1980s have changed the town’s fortunes dramatically. It now has the highest unemployment rate and lowest average household income in France. Last year, I checked the menus at the local schools, to see whether they would be offering the same types of food as elsewhere in France. And I was pleasantly surprised (see a menu from last year). This year’s menus look similarly wonderful–tasty and nutritious. As everywhere in France, there are four courses, but unlike the primary and preschools, the high school kids actually get one choice for the main course. No vending machines are allowed in schools (this is a national policy), and kids are strongly discouraged from bringing lunches from home. Given that this sounds better than many of my work lunches this week, I’m doubting that many of them want to! By the way, I explain more fully in my post on French school lunches that there is no national school lunch program in France. These meals are organized and funded by the local community. Parents pay different rates per meal, more or less related to income (so wealthier families pay more, and poorer families pay less). 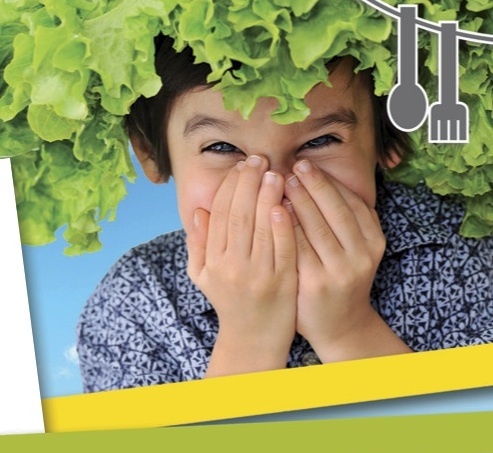 These menus are an inspiring example of what local communities can do when they decide that good food–and teaching children to love healthy food–is really a top priority. As usual, the meals follow a four course structure: vegetable starter; main dish with vegetable side; cheese course; dessert. All meals are served with fresh baguette (eaten plain, usually one piece per child!) and water. No flavoured milk, juice, sports drinks, or pop. No fast food or junk food. Food for thought! 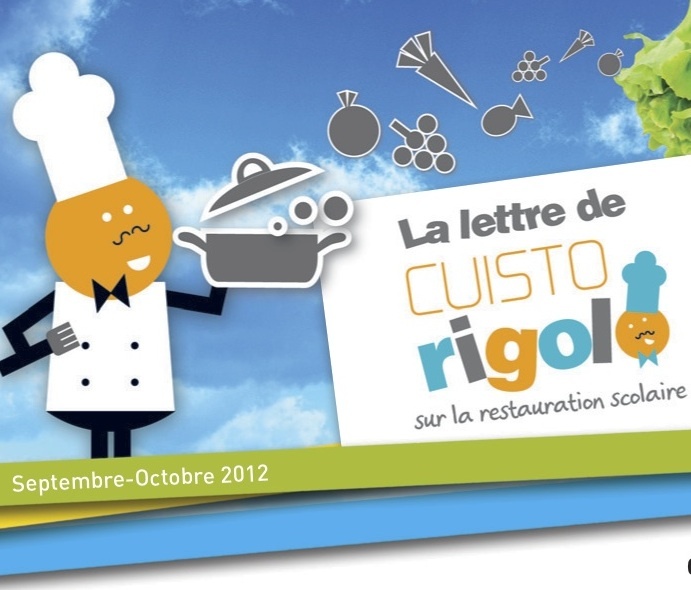 If you’re interested in other menus, you can check them out here (in French!). French schools usually post their menus online for parents to consult–partly to do their own menu planning (as the French prioritize variety, they would try to avoid serving the same thing at dinner if their child had eaten it for lunch), and partly just to share information–because the French love talking about food, and knowing what their kids have eaten! 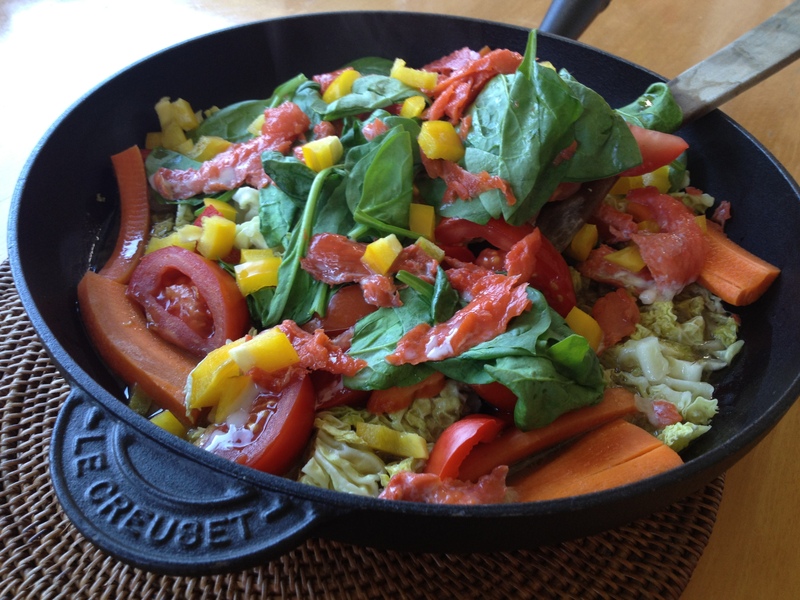 Tabouleh, seasonal vegetables, fresh fruit: What French kids are eating for lunch….this week in Provence! This week we’re in Mouans Sartoux, a small town in the Southern Alps in Provence. It’s the first French town of more than 10,000 people to decide to provide 100% organic meals to children at school. Remember: there are no national subsidies for school lunches in France. Communities organize and pay for the meals locally; parents pay a reasonable price per meal (usually on a sliding scale according to the family’s income, subsidized by municipal taxes if necessary). This is a great example what can happen when communities decide that good food for kids is a top priority. The decision to go organic is usually associated with a policy of buying locally. 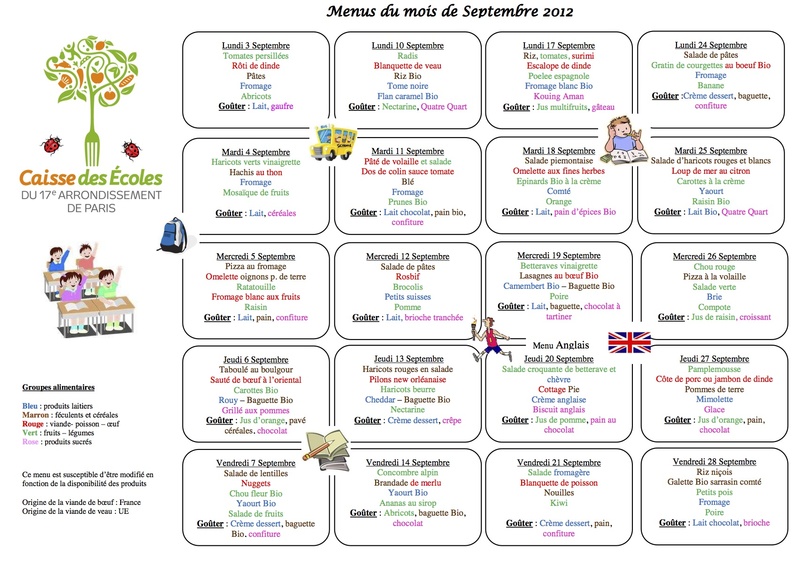 This means that menus which are 100% organic often have less variety than menus in other schools in France. That’s the case here – seasonal vegetables reappear in various formats (fresh salad, cooked salad, puree), which wouldn’t usually be the case. Luckily, there’s lots to choose from at this time of year. Vegetables include eggplant, tomato, zucchini, and onions (to make the wonderful southern French stew called ‘Ratatouille’). Veggie sautees are also popular (like this one I made last night for our family). I can’t even begin to list all of the fruits–but the grape harvest is just happening, so sweet grapes will probably be found on every table. Should all schools go organic? The French government thinks so: it has mandated a target of 20% organic for school lunches (a target that not many schools have met, at least not yet). It’s a debate that French parents and teachers are still having — some would prefer cheaper food and more variety (even if the food isn’t organic and local). But as the transition to organic school food happens in more places, variety should be easier to find–as more local producers go organic. And prices might even drop. But they’ll remain higher than for conventional food. So most communities who have gone organic have also decided to subsidize kids’ meal from the municipal tax budget. This doesn’t tend to raise much protest in France — because people truly believe that food–and teaching children how to eat well–is one of our most important collective responsibilities. Food for thought!